The 2017–2018 year was unusual and extraordinary. We announced "The Ringling Inspires: Honoring the Legacy and Building for the Future" campaign and with your support we weathered the challenge of Hurricane Irma. In 2016-17 The Ringling added over 500 new objects to the collection, completed the Nancy L. Ellis Tea House, and welcomed over 10,000 children from local schools to tour our grounds and exhibitions. This report records the activities of The Ringling from July 1, 2015 to June 30, 2016. We are particularly proud that the exhibitions and programs we presented captured the attention and minds of our community. 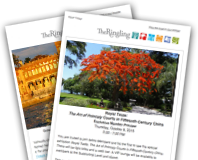 The Ringling Annual Review provides a comprehensive overview of the Museum’s important achievements. Please enjoy the highlights of our exhibitions, programming and acquisitions. This year, The Ringling fulfilled its mission to inspire, educate and entertain by presenting a challenging slate of exhibitions, acquiring new works for the permanent collection, increasing fundraising and greeting a record number of visitors. As the year draws to a close, The Ringling reflects on how thankful we are for the support and dedication of our many valued members. We hope you will take a few minutes to relive some of the year’s successes with us.